After seeing positive results in the Eagle Ford over the past six months, Cabot Oil & Gas plans on expanding its Ealge Ford drilling program in the third-quarter of this year. Company officials cite continued improvements in production and cost savings as the primary reasons for the decision to expand their drilling program. Like may other Eagle Ford operators, Cabot is seeing positive results from pad drilling. 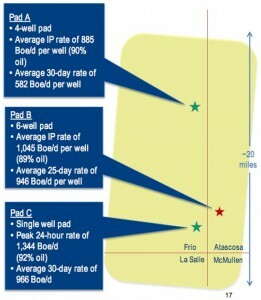 In the first quarter, the company completed its first six well pad with an average lateral length of 6,658'. The wells achieved an average peak 24-hour initial production (IP) rate of 1,045 boe/d per well (89% oil) during their first ten days online. Currently, the company is drilling a five-well pad with a planned average lateral length of over 8,500'. During the first quarter of 2014, Cabot netted 7,271 boe/d, a 42% increase compared to the same reporting period last year. Total net production included 6,839 bbl/d of liquids, which represented a 49% increase. Also during the first quarter, Cabot added approximately 4,000 net acres to its Eagle Ford position through its leasing efforts. In April of 2014, the company revealed that it intends to increase its position in the play. Before the end of the year, the company will almost assuredly strike a deal for more Eagle Ford acreage. Currently, Cabot has ~66,000 net acre across the play, with properties principally located in Atascosa, Frio, La Salle and Zavala Counties, Texas.